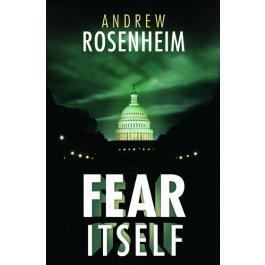 Summary: Set in the tense and uncertain years before the Second World War, when America was still largely conflicted about entering the war on either side, Andrew Rosenheim’s thriller Fear Itself offers a rich depiction of history as it was—and as it might have been. Jimmy Nessheim, a young Special Agent in the fledgling FBI, is assigned to infiltrate a new German–American organization known as the Bund. Ardently pro-Nazi, the Bund is conspiring to sabotage Americanefforts against Adolf Hitler. But as Nessheim’s investigation takes him into the very heart of the Bund, it becomes increasingly clear that something far more sinister is at work, something that seems to lead directly to the White House. Drawn into the center of Washington’s high society, Nessheim finds himself caught up in a web of political intrigue and secret lives. But as he moves closer to the truth, an even more lethal plot emerges, one that could rewrite history. FEAR ITSELF by Andrew Rosenheim is set in the 1936 to 1940 period when the United States is suffering a devastating depression and Europe is moving toward war. The FBI, a key player in the novel, is not yet the behemoth it would later become. The main character is Jimmy Nessheim, a FBI field agent from the Chicago office where J. Edgar Hoover is ridding the office of those tainted by association with an ex-agent he disliked. Nessheim is rescued by FBI assistant director of counter-intelligence Harry Guttman who sets Nessheim up to infiltrate a German-American Bund with pro-Nazi sympathies. This move puts Guttman in direct conflict with Hoover who issued a directive of no FBI covert activity. The FBI is mainly focused on a campaign to rid the country of Communism so Hoover has little time for the European conflict or Hitler which forces Guttman and Nessheim to run their campaign without authority from Hoover. Nessheim’s undercover investigation takes him from New England to Washington D.C. high society to San Francisco’s Chinatown where he discovers that the Bund not only wants to keep the United States neutral in the war but has a desire to eliminate President Franklin Roosevelt’s influence in halting Hitler. When the Bund recognizes that they can’t stop Roosevelt politically, they activate a contingency plan with the code name Dreilander. As Nessheim moves closer to the truth he realizes that Roosevelt’s life is in danger. Andrew Rosenheim puts his story in an historic perspective by having fictional characters interact with real-life characters. Hoover and Roosevelt, Supreme Court justice Felix Frankfurter, FBI agent Melvin Purvis, FBI assistant director Clyde Tolson, and Canadian Chief of British Intelligence in D.C. William Stevenson all play significant roles in the novel. Rosenheim does this very well as he gives the reader a great profile of the United States in the 1930s, particularly as it relates to transportation and technology. He makes his task much more challenging, however, when he builds his suspense around the assassination of Franklin Roosevelt. It’s difficult to maintain the suspense of assassinating someone as famous as Roosevelt when the reader knows beforehand he didn’t get murdered. I think Rosenheim does a good job of maintaining the suspense given this obstacle. I thought it is interesting that Rosenheim gives attention to the prejudices of the 1930s when he makes Nessheim a German-American and his boss, Guttman, a Jew. He also develops a storyline in which a German embassy worker has a homosexual relationship with a black man; something that was taboo to Nazi German authorities from two perspectives. One thing that really irked me as I read the novel is the British spelling of certain words such as “tyres” and “practising”. I recognize the author, an American, was educated and lives in England but the use of the British spelling in a novel about the FBI doesn’t work for me. Since this is an advanced review copy maybe the spelling will be altered in the final publication. Overall, FEAR ITSELF is a well researched book with enough twists and turns and surprises to be a good thriller. It will be of interest to those who enjoy an historical-fiction suspense thriller. I think it's odd that they used the British spellings in a book about the U.S. Still, it sounds interesting. Great review. This sounds interesting - my mom was a child during that time period so I bet she'd enjoy this book. I wonder why the author chose to use British spellings.